What Should Your Venture Capitalist Pitch Deck Contain? The slides of your pitch deck are designed to support your statements, clarify your comments, and give deeper meaning to the pitch you give to venture capitalists (VCs). A well-designed pitch deck is an extremely powerful tool. Your pitch deck is meant to support your presentation, not overshadow you. You can use images, graphs, and a few words to really add punch to your verbal presentation. You want to stand out as a great investment deal, not as the oddball pitch that the VCs giggle about afterwards. Stick to the standard pitch deck topics that you can find on the Internet. Watch other companies’ pitches to see what a standard pitch looks like. No matter how long your pitch is meant to be, make sure that each slide contains no more than one or two thoughts. Infographics are visual representations of information. These graphics can be simplistic cartoons, highly complex drawings, or photographs with information attached. The best infographics are aesthetically pleasing, fairly simple, and instantly understandable. As the figure shows, an infographic shows data in a way that is instantly recognizable because images are combined with traditional data-describing methods such as charts or graphs. In addition, slides with infographics don’t have to remain on the screen for very long to convey their point. They often allow you to move through information more quickly. To convey challenging information. Some ideas are hard to get across verbally — a difficulty that especially plagues groundbreaking products that an audience has never experienced before. In this situation, you may find yourself struggling to convey to the VC exactly what your customers can buy for the retail price. If any confusion exists, your audience will decide that you don’t have a good product. You can use images to pin down loose ends in your description and show to the audience exactly what your product offers. Whenever you find yourself stumbling over something that is difficult to describe, think about whether an infographic could help clarify things. To show growth: A map could be used to describe a company that is planning to expand services across the country over the next two years, for example, with color coding to show how many states were served last year, how many were served this year, and how many you plan for next year. This quick visual drives home the point that your company successfully expanded through a number of states last year and has reasonable growth plans for the near future. To describe details of the deal: If you are raising $5 million and you have $2.3 million committed from one VC, you may put up a pie chart showing the amount raised already. VCs hear a lot of numbers, but that visual representation of a fundraising round that is nearly half committed will stick with them after you leave the room. To distinguish yourself from other presenters: If you are pitching at an event where multiple companies are presenting, you use images to make your pitch stand out and be memorable above all the other pitches. Infographics allow your audience to visualize data in a deeper way. To make an infographic, begin with real research and data, find a way to express those numbers in pictures. Be careful not to get too fancy; the point is clear communication. 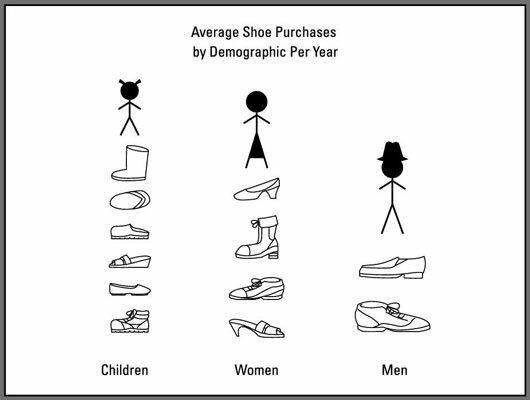 In the example in the figure, the point is that children average six shoe purchases per year whereas men purchase two new pairs per year. Investor pitches tend to be very forward focused: You talk about revenues that are two years in the future, for example, or products that aren’t manufactured yet and customers who don’t know you exist. To give weight to your assertions about the future success or growth of your company, you need to flaunt in your pitch any hard data you have that backs your assertions up. This data can be from things like field research, past product performance, and regulatory experiments. Your own data is a true mark of experience and traction. You may think that your little 50-person survey, for example, is not worth mentioning, but the data can be really important. Say that you put up a slide that says, “80% willing to pay $49/mo” while you talk briefly about the scope of your survey. From this slide, the audience gets the idea that your price point is acceptable to your customer and that you are making an effort to talk to your customers before you try to sell to them. You can combine data with graphics to make your slides both informative and interesting. With the survey example, imagine that the slide has images of your potential customers with the results of your survey as a caption.